From The Woodlands to Tomball to Hockley, west from Katy to Rosenberg, south to Pearland and Alvin and on to League City, Crosby and Atascocita, Houston is growing fast and building new communities to accommodate the needs of new home buyers. One of the newest communities in The Woodlands, Carlton Woods Creekside is built around a Palmer/Fazio golf course. Glennloch Farms is another golf course community in the Tomball area close to Hooks airport and Tomball shopping. On the west side, Falcon Point is one of Katy’s oldest and most well-established communities. Pecan Grove Plantation can be found in Richmond. It is close to the George Ranch, Brazos Bend State Park, and Katy shopping and the Pecan Grove Plantation Country Club. Southwest Houston gives us the following communities. Fort Bend county is home to Riverstone, a 3,700-acre community in the heart of Missouri City and Sugar Land shopping. When complete, it will have 250 acres of lakes and will realize its theme of a water community. Fishing, rock waterfalls, and other recreational amenities make this prime area. South of the city are many new developments. West Ranch, located in Friendswood, is a 766-acre of parks, nature trails, and recreational complexes, and will include a 23-acre Village Center. It is close to shopping and is in the Friendswood ISD system. Tuscan Lakes is located on Galveston Bay at League City and features the architecture style of Tuscany, Italy. On 870 acres it takes advantage of the area featuring boating and water recreation, with miles of jogging trails, and other recreational facilities. In the Lake Houston area many new communities dot the landscape. Crosby, Texas is home for Newport just east of Lake Houston this master plan provides recreation, water sports, and golf to its residents and is conveniently located near shopping Humble has Eagle Springs, which is home to the Eagle Springs Athletic Club and Sports Complex with a 3,800 square-foot clubhouse containing a fitness center complete with state-of-the art cardio and weight training equipment. Come home to something new under the League City sun, Tuscan Lakes. Carefully designed to be reminiscent of the panoramic Tuscan landscape. 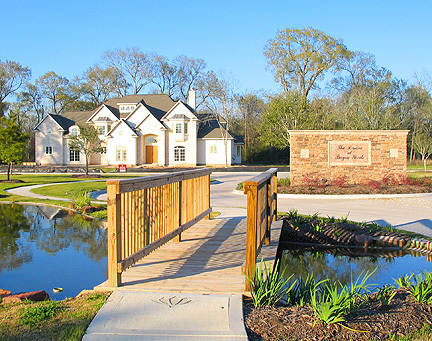 A 3,300-acre lake themed master planned community south of Houston located in Pearland, Texas. This beautiful 766-acre development is bordered by Centennial Park, Chigger Creek and Clear Creek. Residents of SouthFork live in a peaceful community with all the amenities of the big city but the tranquility of the country. A picturesque 600 acre new home community, located in Manvel about 20 miles south of downtown Houston along Texas 288 south. Fairfield offers a world of amenities such as miles of paved greenbelt trails that wind around lakes and through the woods. Miles of winding, tree lined jogging trails frame beautiful, sparkling, fish filled lakes positioned throughout this 7400 acre master planned community.